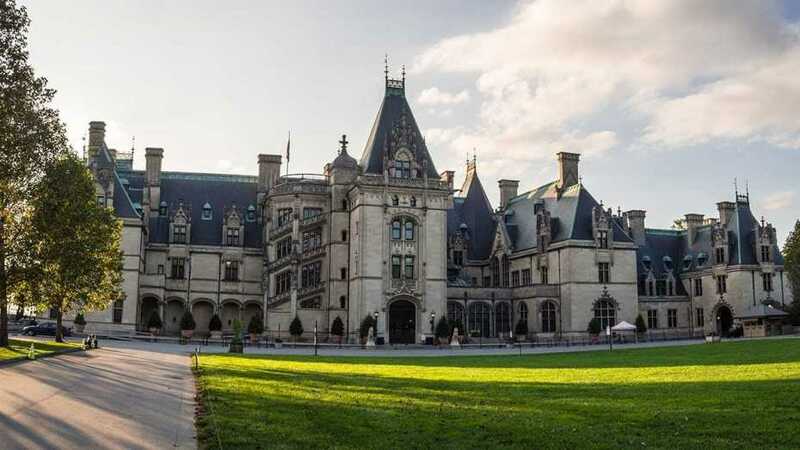 George Vanderbilt's 250-room castle is America's Largest Home and a top attraction in Asheville. Plan a visit to Biltmore House, explore 8,000 acres of grounds, or book a behind-the-scenes tour. Elegance and grandeur abound at Biltmore, America’s largest home. This French Renaissance castle in the heart of Asheville and the Blue Ridge Mountains is an architectural jewel. The home features 250 rooms, including 35 bedrooms, 43 bathrooms and 65 fireplaces. In addition to the house, the 8,000-acre estate is home to forested trails and beautiful gardens, which include one of the country’s most complete collections of azaleas. 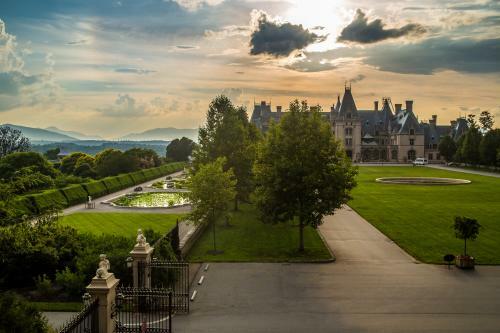 Biltmore is also where you’ll find the nation’s most-visited winery. As you explore the estate, enjoy shopping, dining and luxury accommodations. Biltmore is as magnificent today as it was when it was built more than a century ago. George W. Vanderbilt created the estate in the 1890’s as a grand retreat in the North Carolina mountains. The estate officially opened to his friends and family on Christmas Eve 1895. Mr. Vanderbilt brought in Frederick Law Olmsted, the father of American landscape architecture, to design the gardens and trails. Biltmore was the last great project for Olmsted, whose work also includes New York’s Central Park and the grounds of the U.S. Capitol. The Estate is still privately owned and operated by George Vanderbilt’s descendants. 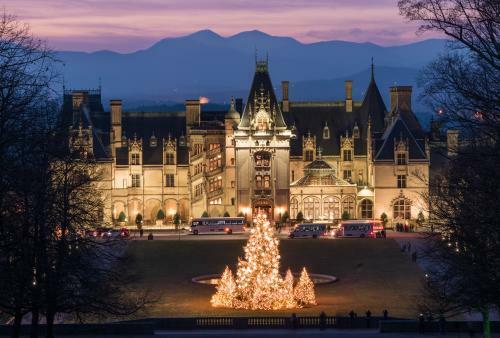 Biltmore Estate tickets cost $60-85, depending on the time of year and the day of the week. Purchase Biltmore tickets online at least 7 days in advance or purchase them at the Asheville Visitor Center for a $10 discount. If you are able to purchase your tickets in advance, you should consider doing so. There are certain "high-volume days" when reservations are required because they may sell out. For a list of those dates, please see the Biltmore ticket guide. Kids 9 and under get in free with a paying adult year-round! Youth ages 10-16 can visit free during the summer (Memorial Day weekend through Labor Day), and are admitted at 50% of adult daytime rates during the rest of the year. There is no admission for individual parts of Biltmore Estate (in other words, there is no separate ticket for just the gardens or just the winery). To access any part of the estate, you will need to purchase a general admission ticket or an annual pass. New Exhibit for 2019: Experience a never-before-seen side of Biltmore House during A Vanderbilt House Party: The Gilded Age (February 8-May 27, 2019), which will give visitors a peek into what the Estate was like when George and Edith Vanderbilt lived there. 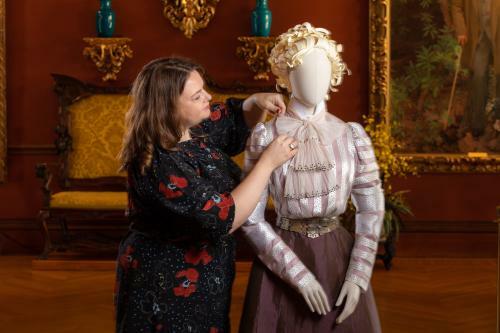 A new audio guide (included with admission) and stunning new reproductions of clothing worn by the Vanderbilts, their friends, family and employees will bring the Gilded Age to life inside the historic home. Take our online photo tour for a sneak peek! Biltmore&apos;s Summer Concert Series features five performances on the estate&apos;s South Terrace in August. Dates and performers for 2019 will be released in spring, but you can check out last year&apos;s full Biltmore Summer Concert Series lineup. A visit to Biltmore is spectacular in any season, with special celebrations offered in the springtime (Biltmore Blooms) and around the holidays (Christmas at Biltmore). 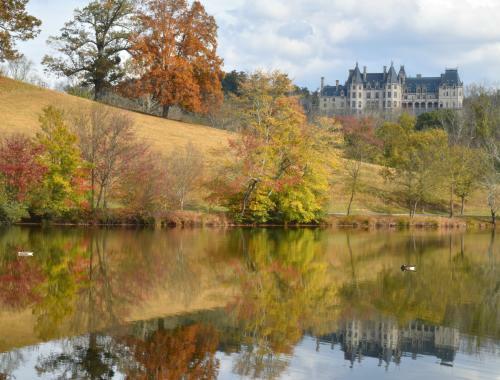 Explore Biltmore Estate - America's Castle in Asheville, N.C.
1. Biltmore House: Discover the elegance and charm of Biltmore house on a self-guided tour that weaves through four floors. 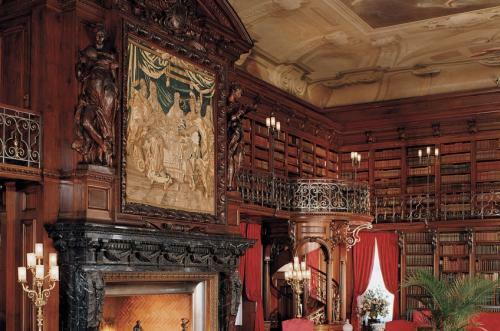 On your way, marvel at the original furnishings, art and artifacts collected by George Vanderbilt. Favorite rooms of the mansion include the Library with 10,000 books and the grand Banquet Hall with its 70-foot high ceiling! An in-depth audio guide and guided behind-the-scenes tours are available at an additional cost. 2. Gardens: Take a stroll through meticulously manicured gardens designed by America’s foremost landscape architect, Frederick Law Olmsted. Begin in the Italian Garden, which features a series of reflection ponds, before heading down to the patterned Walled Garden. The Walled Garden features a rose garden with more than 250 varieties. In the spring as part of the Biltmore Blooms celebration, see the bright blooms in the Azalea Garden, one of the largest azalea collections in the country. Don&apos;t forget to head inside the Conservatory greenhouse, which showcases a wide variety of exotic plants including stunning orchids. 3. Bass Pond and Trails: From the gardens, the Bass Pond is just a short walk away. Sit a spell at the historic boathouse. Or choose a bench along the shore of the pond that offers a view of the beautiful red brick bridge that was featured in the movie, Last of the Mohicans. At the far end of the pond, you’ll find a man-made waterfall – a perfect place to sit and relax. The trail to the Bass Pond is part of a 22-mile network of walking and hiking trails on the Estate. All trails are pet-friendly (leashed dogs welcome). Trail maps are available at the main ticketing center when you arrive on the Estate, or from information kiosks located in front of the house and at Antler Hill Village. 4. Biltmore Winery: From the house and gardens, follow a beautiful drive with pastoral and mountain views to Antler Hill Village, the location of Biltmore Winery. With your admission to Biltmore, you receive a complimentary wine tasting. At the winery, you&apos;ll find more than 20 handcrafted vintages including reds whites and rosés. The true wine enthusiast will love the opportunity to take a guided tour of Biltmore Winery’s production facility or a guided tour of the breathtaking vineyards. 5. Antler Hill Village: In addition to the winery, Antler Hill Village is home to the farm, where you can get a taste of what life was like for those who lived on the estate raising livestock and tending crops. Children will delight at the opportunity to meet the farm animals and play on the playground. In the heart of the Village, stop in at The Biltmore Legacy museum to see special historical exhibits, grab an ice cream at The Creamery, shop at the stores and or dine at Cedric’s Tavern. The Village is also where you may find artist demonstrations or live music. 6. Guided Outdoor Adventures: Play in Biltmore’s 8,000-acre backyard! Choose from Biltmore Estate tours and adventures such as fly fishing, river rafting/kayaking, biking, Segway tours, Land Rover tours and falconry. All these experiences (and more) are available to daytime guests, overnight guests and annual passholders for an additional charge. Many of the experiences do require making a reservation in advance. 7. Biltmore by Horse: Biltmore has been named one of the top places in the world to go horseback riding. Biltmore offers a variety of guided horseback rides and tours for a truly memorable adventure. Or, enjoy a relaxing journey on a horse-drawn carriage led by Belgian draft horses. 8. Dining: Choose from six restaurants that range from fine to casual dining. Biltmore Estate’s working farm provides the fresh herbs, salad greens, meets and eggs for many of the dishes served. Biltmore sources prime cuts of hormone-and-antibiotic-free beef and lamb from estate-raised Angus cattle and White Dorper sheep. Other ingredients such as mountain trout and farmstead cheese are sourced from local farmers. 9. Shopping: Discover treasures and purchase unique gifts at the estate’s charming shops. Shop arts and crafts, fashion, home accents, wines, books, toys and Christmas wares. There’s even a confectionery where you can choose from a tempting array of sweet treats. Feel as though you’ve entered the time when George and Edith Vanderbilt extended their boundless hospitality to family and friends. A new audio tour and reproduction clothing will be on display during this time. 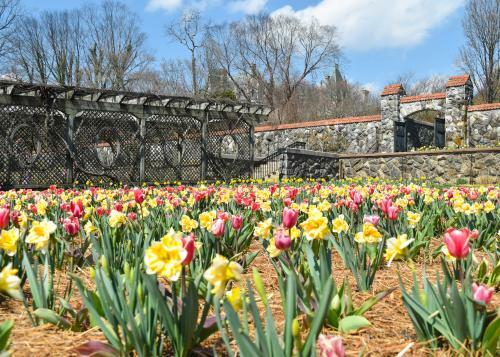 Welcome spring in style with more than 130,000 flowers blooming across Biltmore Estate. Enjoy the Biltmore gardens from a new perspective with large-scale model railroads and handmade botanical buildings in two estate locations: the Conservatory and Antler Hill Village and Winery. Biltmore’s South Terrace provides for a magical concert venue for big-name, national performers. Kick off the holidays with this annual tradition in which a 35-foot tree is brought to the estate on horse-drawn carriage before being lifted into place in the grand Banquet Hall. Biltmore shines with holiday grandeur with stunning decorations. In Biltmore house, see more than 65 hand-decorated trees, including the 35-foot tree in the Banquet Hall. Fresh poinsettias brighten the rooms. And, Antler Hill Village lights up with light displays outside and beautiful decorations inside Biltmore Winery. At night during the holidays, Biltmore lights the dozens of fireplaces and candles in Biltmore House, and live music adds to the special ambiance. There are three places to stay on Biltmore Estate. For a more casual experience, choose the Village Hotel on Biltmore Estate, located next to Biltmore Winery. The Inn on Biltmore Estate offers four-star elegance. And, the Cottage on Biltmore Estate is a historic accommodation offering a unique, private experience. Just outside the entrance gate of Biltmore Estate is historic Biltmore Village. 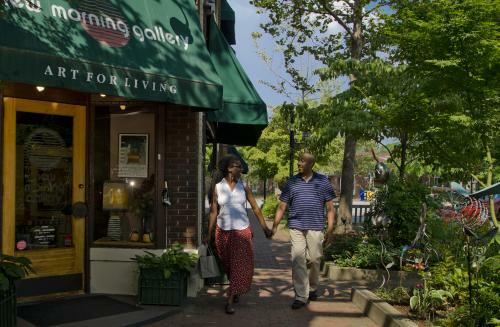 Biltmore Village is a historic district that is home to fine art galleries, top notch restaurants and a mix of boutique and nationally recognized shops. 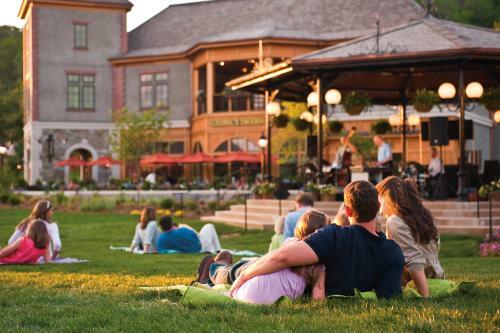 There are several places to stay in Biltmore Village, from luxury accommodations to family-friendly hotels. See our places to stay page for more great accommodations in and around Asheville.